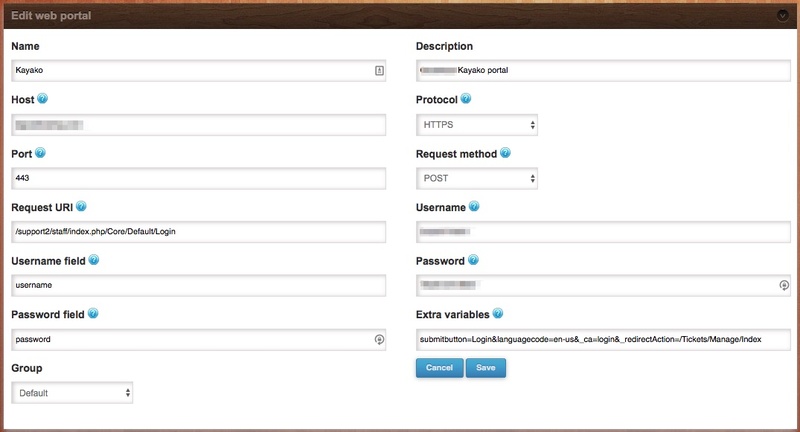 The best way to figure out the settings to add a control panel or datacenter portal or Webportal to ezeelogin is to use an HTTP traffic analyser such as httpfox firefox addon (https://addons.mozilla.org/en-US/firefox/addon/httpfox/). 8. Find the row in httpfox that send the data to the portal (Usually Method = POST) and click on it. Details will be displayed in the bottom section of httpfox. 10. Click on the "POST Data" tab to get the username and password field names which will be the parameter names. Check the values of parameters for the random string you entered for username and password fields in the login form to identify the parameter names. We can figure out the setting to add control or webportal without httpfox addon. 10. Check the values of parameters for the random string you entered for username and password fields in the login form to identify the parameter names. Posted - Wed, Jun 14, 2017 at 4:18 AM. This article has been viewed 1991 times. Add servers behind a Tunnel Host in SSH Gateway or Add servers that are accessible via port forwarding via the ssh gateway server. How to do Port forwarding from jump server to target Linux machine? How to stream the ssh sessions in real time? How do I view the root password set for the server that i just added? How to copy or delete a file in jump server users home directory? How will an ssh gateway user login into a remote server/ cloud instance as a system user with the same name as the ssh gateway user? Parallel Shell - How to use it? How to execute command on a custom group of servers? or how do i create a list of servers where i would like to execute my command in parallel? How to copy a file to a remote server or group of servers behind the ssh jumphost? Parallel Copy - How to do it? How to increase the speed of execution in parallel shell? How to ssh to remote server with the same username with which i logged in ezeelogin ssh gateway?